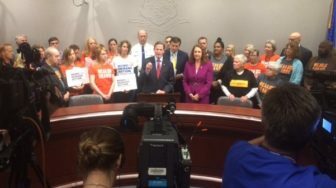 Sen. Richard Blumenthal, center, Sen. Chris Murphy and Rep. Elizabeth Esty, at right, calling for better background checks. A press conference to promote a relatively modest gun-control measure became a platform Friday for U.S. Sen. Chris Murphy to denounce the U.S. Congress for refusing to act in the wake of high-profile mass shootings like the one Thursday in Oregon or the quieter daily toll of gun violence in the U.S. The press conference was scheduled days ago to publicize a bill Blumenthal and Murphy intend to file with the support of Esty, whose 5th Congressional District includes Newtown, where 20 first-grade students and six educators were shot to death in December 2012. “By a tragic and sad coincidence, we are here today,” Blumenthal said. The legislation would bar federally licensed firearms dealers from completing a sale before the completion of a criminal background check. Under current law, the dealers are allowed to complete the sale if a check takes longer than 72 hours. It was inspired by the mass murder on June 17 at a church in South Carolina. The defendant, Dylann Roof, was able to purchase a firearm under the “default to proceed” provision of the Brady Handgun Violence Act. The FBI since has said that Roof had a record that would have barred him from the purchase. Over the past five years, guns were sold to more than 15,000 buyers who eventually were shown to be ineligible to purchase a firearm, they said. Blumenthal said Walmart already has voluntarily adopted the standard in the proposed legislation, but other national retailers have not. Connecticut state law already requires a completed background check before a firearms sale is completed.